Our patrol services, powered by a fleet of hybrid vehicles are customized to meet your unique needs. Frequently, patrol officers are asked to lock and unlock facilities, check windows & doors, conduct High Visibility vehicle patrols of your home or business, provide after-hours security escorts and respond to alarms. In addition we will document safety hazards, vandalism and remove anyone that may be engaged in undesirable/prohibited activity. Enjoy greater peace of mind while protecting your assets with our alarm response service. Upgrade to Alarm Response and receive not only Priority response to alarm activations but eliminate law enforcement false alarm fees. We would also provide Courtesy vacation patrol (1 week), 24 hour response and Lock-out service. *Alarm response provided for specific zip codes throughout San Diego County. Our vehicle patrol services provide peace of mind and accountability with security plans based on your needs. 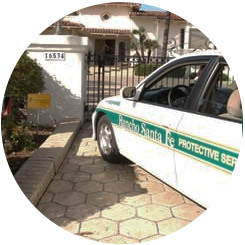 A trained, courteous and professional security officer will patrol your property in a highly visible and marked Rancho Santa Fe Protective Services vehicle. Services include vehicle patrol, foot patrol, locking and unlocking facilities at designated times, providing parking enforcement, safety escorts, and general security-related duties. We can also respond to non-emergency situations, such as noise complaints, trespassers, and other disturbances. If you have a current alarm system monitored by Rancho Santa Fe Security Systems, we also provide an option for armed alarm response.